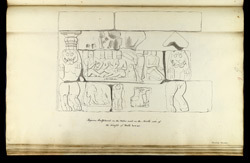 Pen and ink drawing of the sculptures on the outside of the Mahishasuramardini Cave Temple at Mamallapuram, by an anonymous artist, part of the MacKenzie Collection and from and Album of 37 drawings and plans of the temples and sculptures at Mamallapuram, c. 1816. Mamallapuram, a tiny village south of Chennai (Madras), was a flourishing port of the Pallava dynasty from the 5th - 8th centuries. The site is famous for a group of temples, a series of rock-cut caves and monolithic sculptures that were most likely created in the 7th century reign of Narasimhavarman Mahamalla. The caves are all fronted with fine columns resting on seated lions, typical of the Pallava style. The Mahishamardini Cave Temple dates from the mid-7th century and consists of a long verandah with three shrines. Remarkable sculpture panels are carved on the side walls. These represent Vishnu sleeping on the serpent Ananta and the goddess Durga killing the buffalo-headed demon Mahisa.